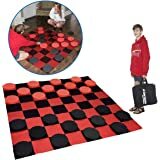 Sold by YardGames and Fulfilled by Amazon. Gift-wrap available. 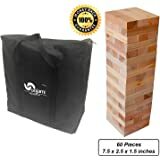 Amazon's Choice for "giant jenga"
Sold by YardGames and ships from Amazon Fulfillment. 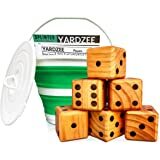 YardGames brand is based on the principal of bringing quality products that provide hours of entertainment. 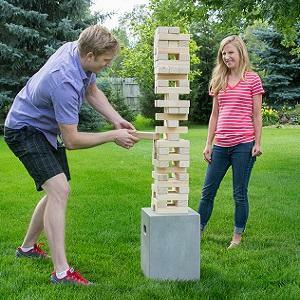 We hand select all of the games that have been proven to provide the most enjoyable outdoor experience. 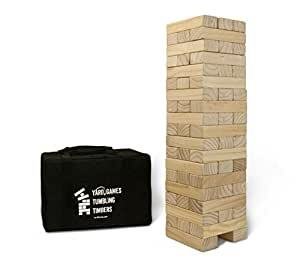 First, build the tower on top of a flat surface, then take turns removing one block at a time. 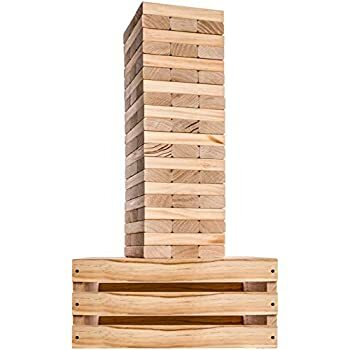 The object is to be the last player to successfully stack a block without knocking down all the timbers. Get everyone outside and active. Includes high strength carrying case and instructions for easy setup and transport. 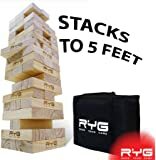 Game can stack to over 5 feet tall depending on experience. 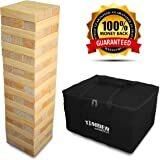 YardGames Giant Tumbling Timbers includes 56 - 1.5" x 2.5" x 7.5" pieces and 19 rows of tumbling timbers fun. 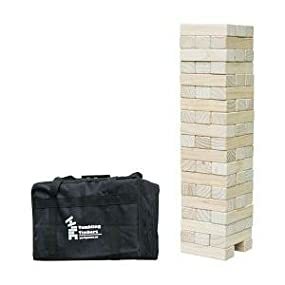 Please note this game comes with 2 extra timbers for the bottom row for added height and easiest packaging arrangement. 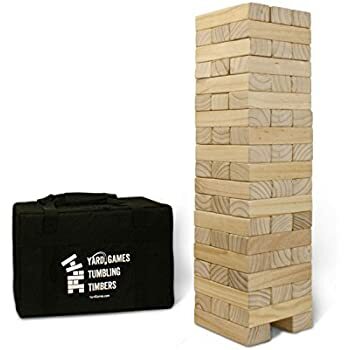 This timber game stands 2.5 feet tall to start and depending on your level of experience can reach a height of 5 feet! 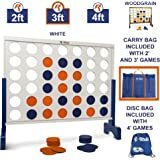 this game is great to take outdoors and is perfect for group events, parties, camping and more. 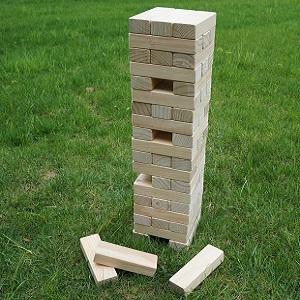 Tumbling Timbers can be played by 2 or more players. 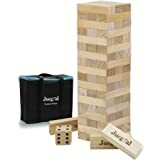 First, build the tower, then take turns to remove a block (using only one hand) and place on the top. 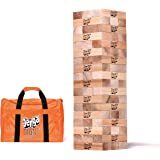 The object is to be the last player to successfully stack a wooden block without knocking down the tower. 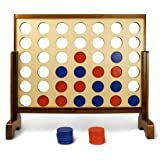 This set is made with beautifully crafted undecorated solid pine wood and is hand cut and sanded for smooth game play. 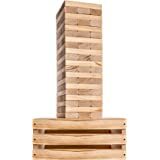 The bottom level only has two timbers to begin, using 56 timbers allows for the easiest packing arrangement. Our set comes with two extra blocks to add to the height and fun. CAUTION: As with any wooden product, impact or damage during shipment or play could cause splintering. If a piece becomes damaged, remove it from the set to prevent injury. 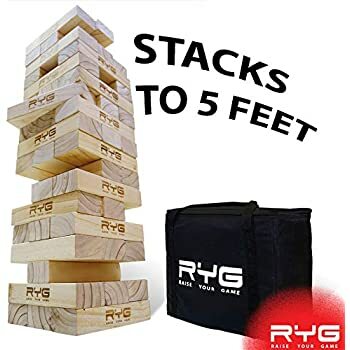 5.0 out of 5 starsGreat entertainment for big and little kids! 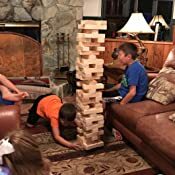 I purchased this game to keep the adults entertained at a Halloween party we were hosting. I was debating if I should pay extra for the Jenga branded version but I'm glad I didn't spend $50 more. This was perfect for our needs. I liked that each of the timbers were sanded and slightly beveled for a smoother edge and feel. To make it more accessible, I placed the set on a child's Lifetime 24" x 24" folding table which was about 22" off the ground -- the height worked perfectly. 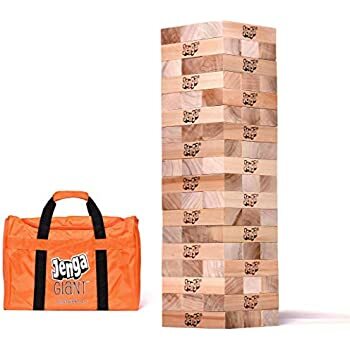 Everyone had a blast playing with this game and it was soon taken over by the younger kids. My sister has a much larger set but I actually prefer this size better as it's safer if toddlers / younger children are playing with it. Putting this away is a bit of a challenge because it fits in the nylon carrying case like a glove. So, take note how it's stored when you receive it to make it easier to put it pack up. We are very happy with our purchase and know it will provide a lot of fun for years to come. Packaged well but they are made of a very soft wood, pine, and you have to keep them away from any water or they swell up and get deformed. 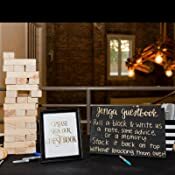 5.0 out of 5 starsPerfect for a wedding guest book! 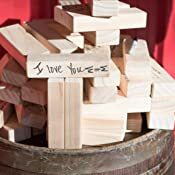 We had our wedding guests pull a block and write a memory or advice for us and stack the block on top. It worked great. I was going to make one of these sets myself, but glad I didn't because now I realize how much work it would have involved. 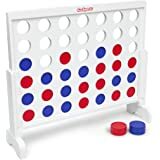 These are perfect and fun to play. Blocks are sanded well so they are smooth and slide easily. Great product and is going to be the focus of our next party. Watch your toes because when this collapses you don't want to be in its path. 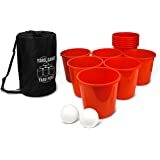 Purchased these for "game nights" on the terrace during the summer and they were much more popular than i expected. These are solid and seem like they will last quite a while. 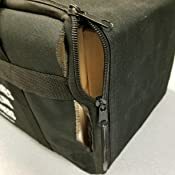 Only think i would be interested in would be to possibly buy these stained so humidity wouldn't really be a factor as Im assuming these may give in (But maybe they are pressure treated or something so I will update if they ever do warp ) Solid set and bag makes storing a breeze! These are great! Good quality. We used them on the sidewalk for a level surface and I was afraid of denting them but they have held up well. The carrying bag seems sturdy and after a month of fairly regular use isn't showing any signs of wearing. 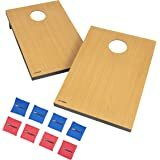 I would recommend these, we've been having a lot of fun with them. Great game for the driveway. Blocks are as appear in the photo. Carrying case is flimsy & unbalanced. 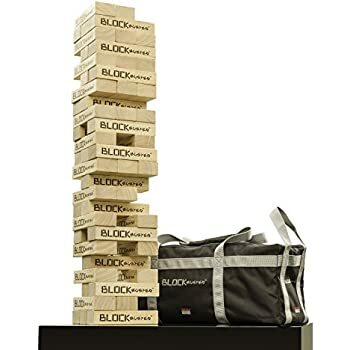 Would have trouble carrying the game over a long distance as the blocks are heavy.